Since the establishment of the TAGA Student Chapters in 1985, student chapters have produced technical publications to showcase their student research, and starting in 1993, the TAGA Board of Directors has awarded a Grand Prize Award to recognize their efforts in producing their TAGA Student Publications. Renamed in 2006 as the Helmut Kipphan Cup (after Dr. Helmut Kipphan—for his time, support, and advocacy of the TAGA Student Chapters), the award is now a traveling trophy that is presented to the school that has produced a Student Publication that excels in technical content, print quality, and design. In addition, several Special Recognition Awards will be presented to schools that have proven their abilities in these individual areas. An additional “Attendees’ Choice” award will be given to the school that receives the most votes from all conference attendees. The student publication is intended to be a collection of student research in the associated areas of graphic technology. Any institution with an active TAGA student chapter is encouraged to participate. All included research articles must be authored by the students within that institution. Students do not necessarily need to be TAGA members. Chapters are encouraged to include any submissions for the Harvey Levenson Undergraduate Student Paper and/or Dusty Rhodes Graduate Student Paper in the student publication, although this will not affect the judging. The publication must be produced primarily by members of the student chapter. If professional assistance is used, this should be indicated in the production notes. Student chapters must submit a formatted PDF of the entire publication to taga@printing.org at the posted deadline prior to the Annual Technical Conference to be considered for the Technical Writing criteria. Failure to do so will affect eligibility for the Grand Prize and Special Recognition for Technical Writing Awards. Please produce a minimum of 150 publications for distribution to the judges and conference attendees. Technical Writing (25 pts) – The award for technical writing in the student publication is based on the quality, accuracy, and relevance of the research. The research should present original ideas by the student author. However historical reviews are acceptable. Complete and accurate bibliography and references must be included for each paper. Publication Design (25 pts) – This award is for the design aspects of the student publication. The overall design quality is considered. This includes choice and use of type, images and graphics. The cover and/or packaging of the publication is also considered. If a theme has been used, how well is it carried throughout the publication? Production Quality (25 pts) – The award is given to recognize the level and quality of student participation on the production of the Student Publication. It is very important to include detailed production notes in the publication that indicates the amount of student participation. Quality of the print and finishing will also be judged. Electronic Publication (15 pts) – The award is given for the design and creation of an electronic publication, eBook, Interactive PDF, or Web Page that corresponds with the printed student journal. Functionality, ease of access, and consistency of the visual aesthetic with the journal are taken into consideration when deciding the total number of points given when judged. 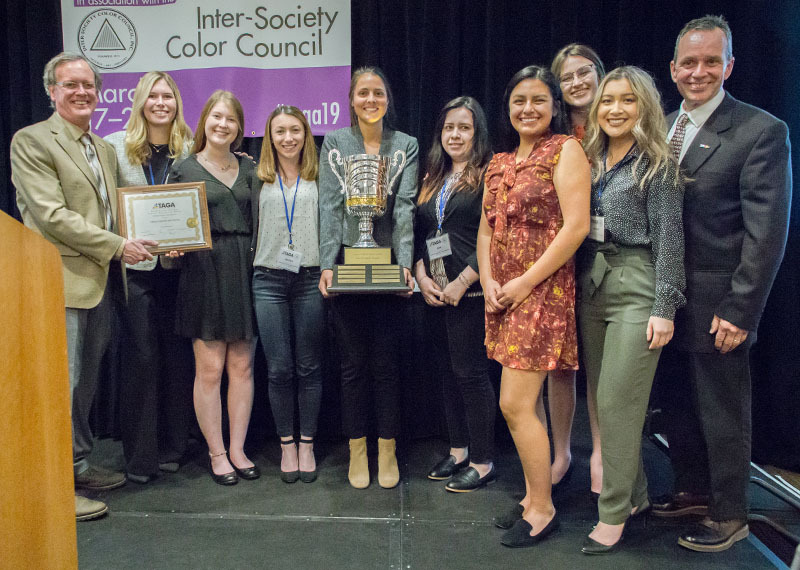 Attendee’s Choice – This award allows the (non-student) attendees at the Annual Technical Conference (ATC) to voice their opinion for what they consider the “best of show” Student Publication. A separate ballot (one per attendee) will be available for attendees. The Attendee’s Choice score is not included in the Grand Prize Award. Grand Prize Award (The Helmut Kipphan Cup). The Grand Prize will be awarded the “Helmut Kipphan Cup,” a traveling trophy that will be inscribed with the school names and years of all previous Grand Prize Award winners. The winning school will also receive a certificate that indicates its Grand Prize Award. The Trophy/Cup will be awarded to the winning school during the Annual Technical Conference. The student chapter representatives will be able to bring the Trophy/Cup back to their school for display and promotion for the following academic year. The security and safe return of the Trophy/Cup will be the responsibility of the school (loss or damage will be the responsibility of the TAGA chapter/school). The Trophy/Cup must be brought to the following year’s TAGA Annual Conference; if the chapter does not plan to attend, then the Trophy/Cup must be returned to the TAGA office (at Printing Industries of America) prior to the TAGA Annual Technical Conference the following year. The Grand Prize winner is ineligible for additional Special Recognition awards, although a single school can receive more than one Special Recognition Award. The Grand Prize Winner is eligible for the Attendee’s Choice Award. *Active student membership is required for submission in the Kipphan Cup Student Competition.